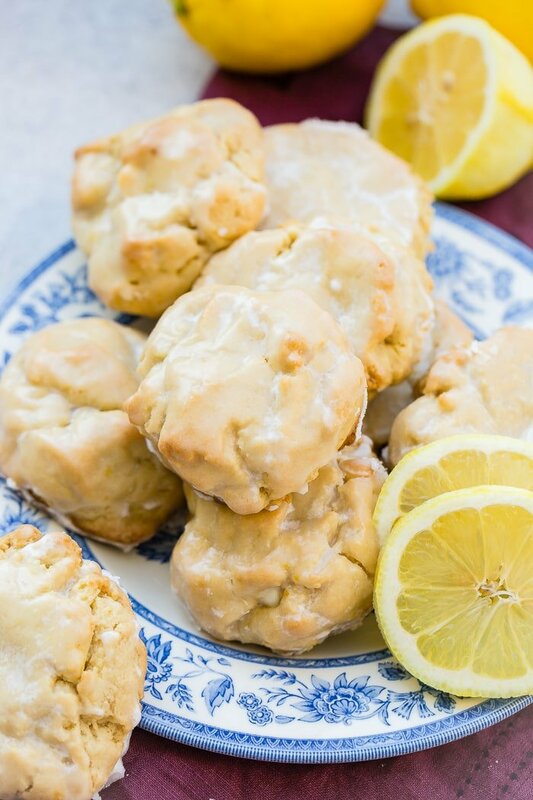 I don’t even know where to start, these Sweet Glazed Lemon Cookies are pure heaven and I’m happy to say that they are not only delicious but soft and chewy too! Awhile back we discovered a cookie delivery company unlike any other right now. 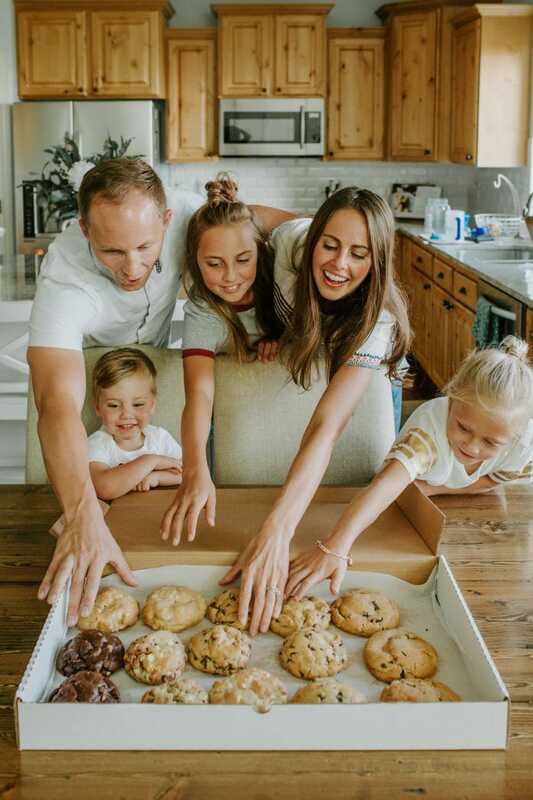 Utah is slammed with these delivery companies right now, order cookies, have a hot, gooey, fresh piece of deliciousness delivered right on your doorstep without ever turning on the mixer. But none are doing what these Sweet Glazed Lemon Cookies are doing. 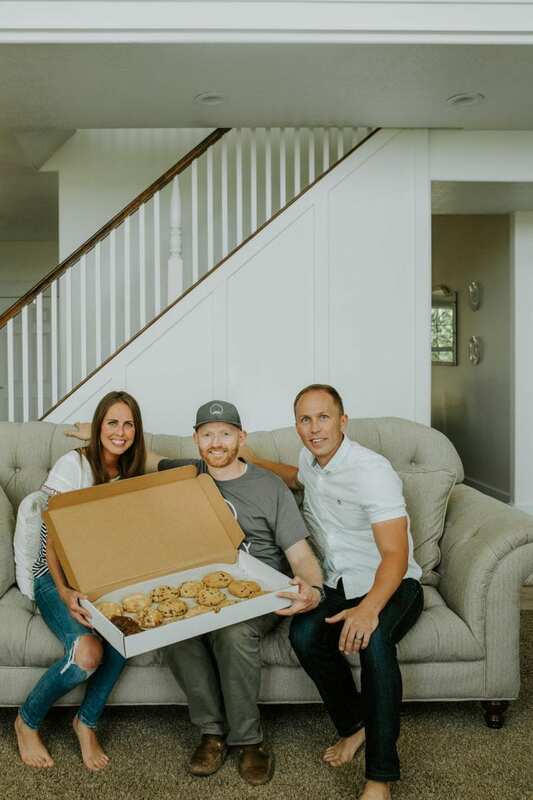 Goodly Cookies is a delivery company that’s not only feeding bellies, but a portion of every cookie sale goes to Huntsman Cancer Center. I mean, look at that cookie! Are your tummies grumbling yet? You mean, you get to eat warm cookies, and do something for others without ever leaving your couch? Yes!! Do it! It’s so worth it. And for those of you not in Utah, don’t you worry, I’ve got you covered. We teamed up with Goodly Cookies this summer to create a fresh new cookie and celebrate the sun finally sticking around for a bit. 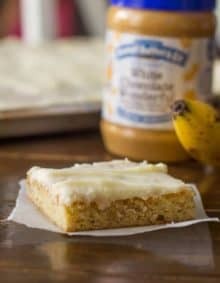 It’s a glazed lemon cookie and you can add white chocolate chips or be a purist and stick with just the cookie. 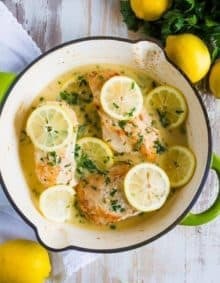 They are thick, chewy, and have an amazing lemon flavor. But the glaze, oh how I adore that lemon glaze! It is an absolute must for these delicious cookies!! 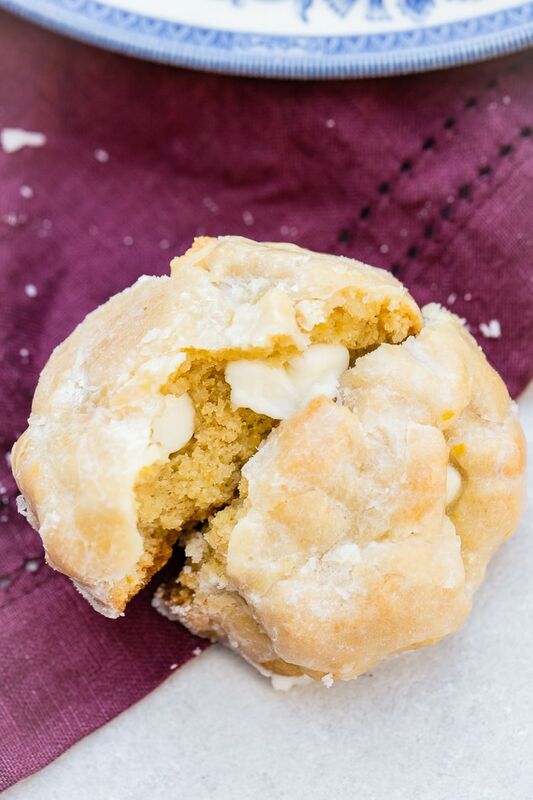 Sometimes cream cheese is used in a cookie to make it extra soft and chewy. It doesn’t melt down like butter so it gives even more oomph to the cookie, but you totally cannot taste the cream cheese at all. If you use cream cheese, just make sure it’s at the same temperature as the butter so everything mixes together properly. Cream cheese isn’t always on hand at our house, though 90% of the time it is, but if you’re out just use an equal amount of butter. To get more lemon flavor in the sweet glazed lemon cookies, don’t look to the lemon juice, look to the zest. Those oils that are found in the skin of the lemon pack more flavor than the juice and don’t change the texture, so pile that stuff in there depending on your own tastes. We personally love 2 tablespoons of zest, but again, it’s up to you. Finally, to chip or not to chip. In any other cookie it’s a no-brainer. I mean, who has ever heard of eating chocolate chip cookies without the chocolate chips, but in a lemon cookie it’s a different story. 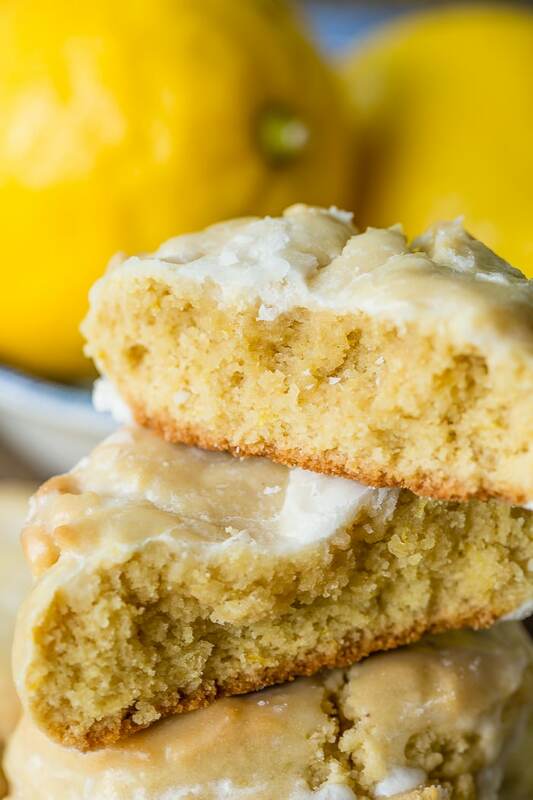 White chocolate chips add the most amazing creamy goodness to the cookie and it totally helps to balance the lemon and that sweetly tart glaze, however sometimes lemon just needs to stand on its own. So whether you’re feeling in the mood for chocolate or just a lemonade inspired cookie, these sweet Glazed Lemon Cookies have totally got your back. 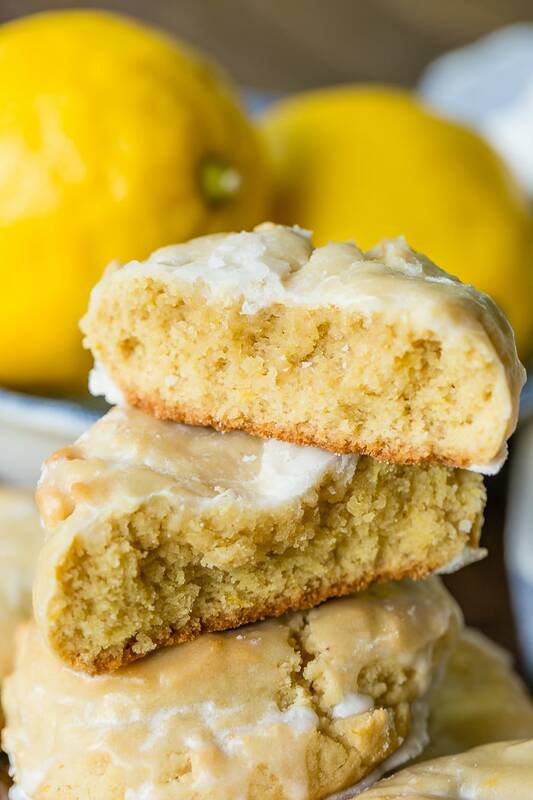 This lemon glaze for the sweet glazed lemon cookies is an absolute cinch to make, but you’re going to have to decide how you like it best. You’re going to add powdered sugar to a bowl and squeeze in the juice of one lemon from when you zested into the dough. Make sure you squeeze the lemon into a strainer over the bowl or into your other hand so seeds don’t fall in. Whisk everything and add more of the juice or powdered sugar if you want to change the consistency. 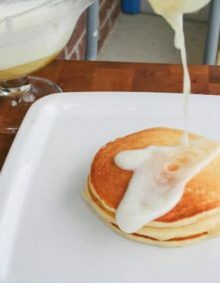 You want it almost like heavy cream, but not as thin as milk. Glaze the cookies after they’ve rested only a few minutes for the best results. And as much as this is going to shock you, I actually love lemon cookies that are no longer hot from the oven like a chocolate cookie would be, so set them aside to cool before digging in. 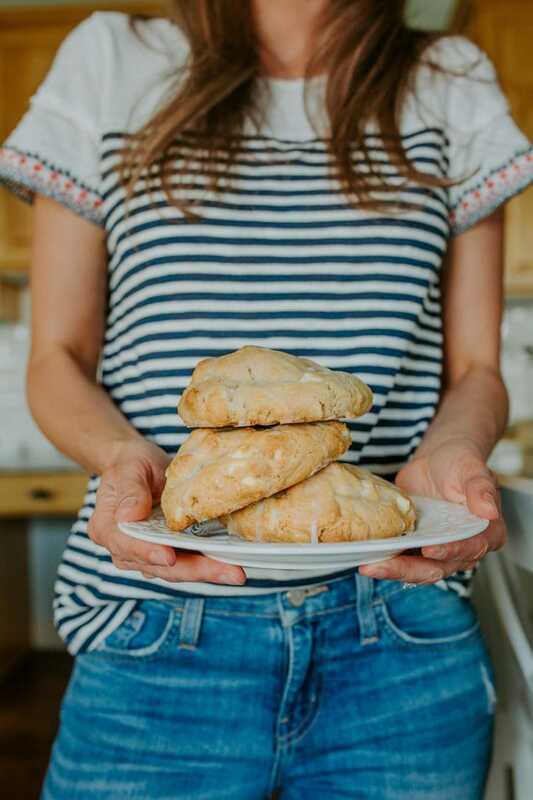 So head on over to Goodly Cookies and order the Oh Sweet Lemon Cookies, and maybe a few chocolate chip because who can resist a classic, especially one that goes to a good cause! 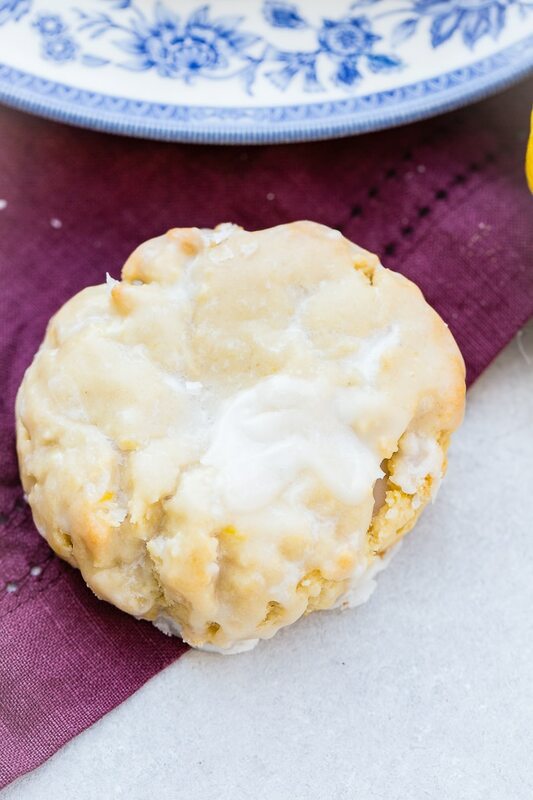 Or make these Sweet Glazed Lemon Cookies at home! 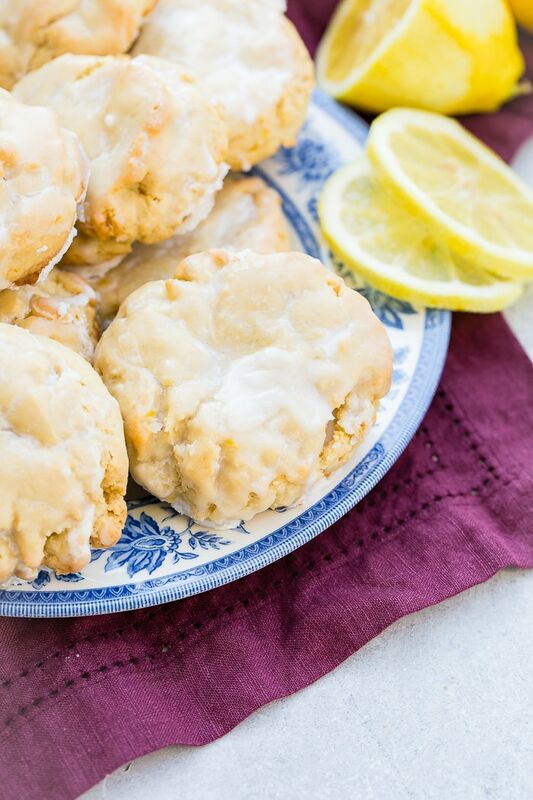 I don't even know where to start, these Sweet Glazed Lemon Cookies are pure heaven and I'm happy to say that they are not only delicious but soft and chewy too! In a standing mixer, add the butter and cream cheese and beat until smooth. Add the brown sugar and white sugar and beat again. Add the lemon zest and egg, and mix at medium speed until incorporated. In a separate bowl, whisk together the flour, corn starch, baking soda and salt. Add the dry into the wet along with chocolate chips and mix on low speed, then turn it up to medium speed until the dough comes together. Scoop using a cookie scoop (finally, one that has a warranty as those things break too much!) or 1/4 cup measuring cup onto the pan. Remove from the oven and cool for 2 minutes, then brush with the glaze. In a small bowl, whisk together the powdered sugar and lemon juice until smooth. Thanks Jamie! I must make them a little smaller, but the bigger the better in my book! Very good and reminds me of a lemony scone. Exactly how I like it. Husband says he loves them! Aren’t they so good?! There disappear in no time at our house! Can these be frozen after they are done? Can I make the dough ahead of time and then bake them later? Yes absolutely! The dough can be stored in the freezer for up to 4 weeks! These lemon cookies are so delicious! I made them last Sunday for dessert. I plan on making them again this Sunday! Love them! Thank you for the recipe! 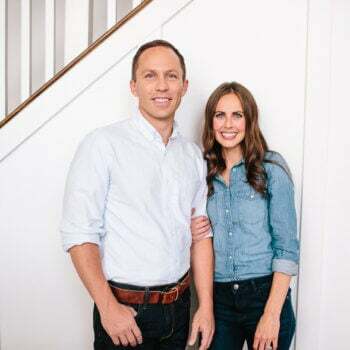 Aren’t they amazing!?! So glad you enjoyed them! Thanks for leaving a comment! When I see these, “scones” come to mind and I’m wondering how dried blueberries would taste (instead of the white chips)…if there is such a thing as dried blueberries! Regardless, I will be making them. Thank you. Ohhhhhh…that is a great idea! I will need to try that too! I wonder if they have freeze dried blueberries. And yes, they are so huge a delicious, they are almost like scones! The recipe says 1/2 cup of white chocolate chips but it’s not listed in the directions. 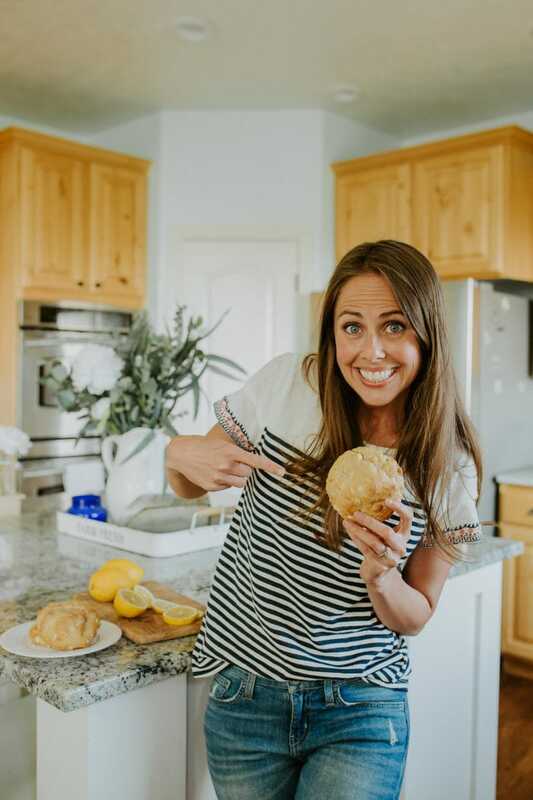 Where are the chips used in the cookie recipe? Can’t wait to try oh so many of your recipes!! Especially ones with a Great flavor of ‘lemon’!! Do you have these recipes in booklet form or a Large card size where you could order so many per month?? In Add on booklet form would be great!! Just asking.. Thank you bery much!! 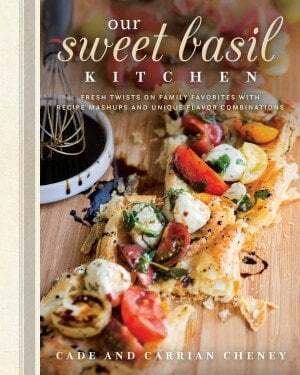 There’s a cookbook out on amazon called Our Sweet Basil Kitchen.